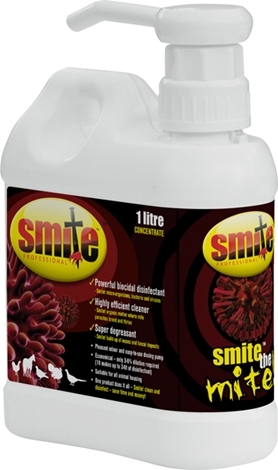 The Ultimate Red Mite Eliminator. One Product does it all - Clean, Disinfect and Eliminate mite! The Dredded RED MITE? If not sure whether you have a mite problem or not - please click here to find out more! Is An extremely powerful, low odour, disinfectant cleaner and degreaser which has proved itself to be an effective eliminator of micro-organisms, bacteria and viruses. Removes build-ups of organic matter – the habitat where red mite and other parasites thrive, efficiently dissolving the pests waxy coatings and deposits. Suitable for all animal housing, not just chooks! 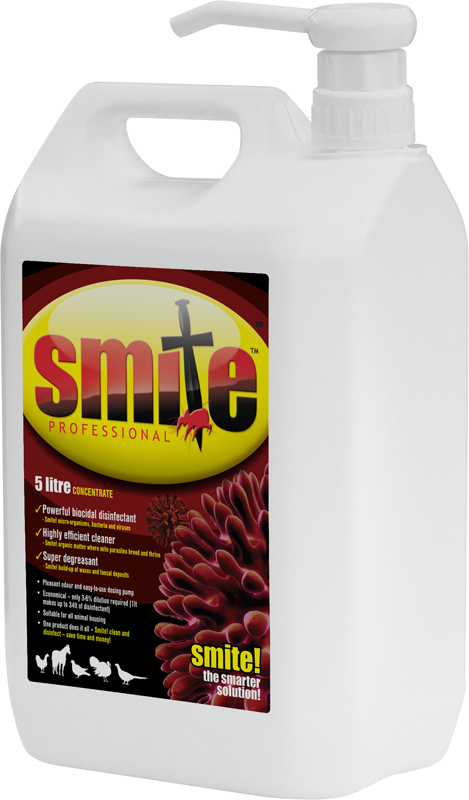 One product does it all – Smite! Clean and disinfect – save time and money! Smite professional bulk pack - Only $14.95 per ltr!